Taking the back roads, avoiding Autobahns, we left early on Saturday morning in the direction of the Alps. Warming up the tyres on the bikes on some well trodden tracks between Zurich and Zug, I knew it was going to be a great weekend. First on the schedule was the famous (thanks to Goldfinger) Furka Pass. Suffice it to say, it’s a great driving road, with some great corners, and a great view for the entire course of the road. Snaking through some of the most literally awesome landscape I’ve ever seen was really quite an experience. The Grimsel Pass was a more involving ride than Furka, not wishing to take anything away from one or the other, but it was simply excellent turn after turn. I mean, look at the satellite view in the image above. Those corners! I learnt more about riding a motorbike there in an hour than in weeks of riding around the streets of a city. 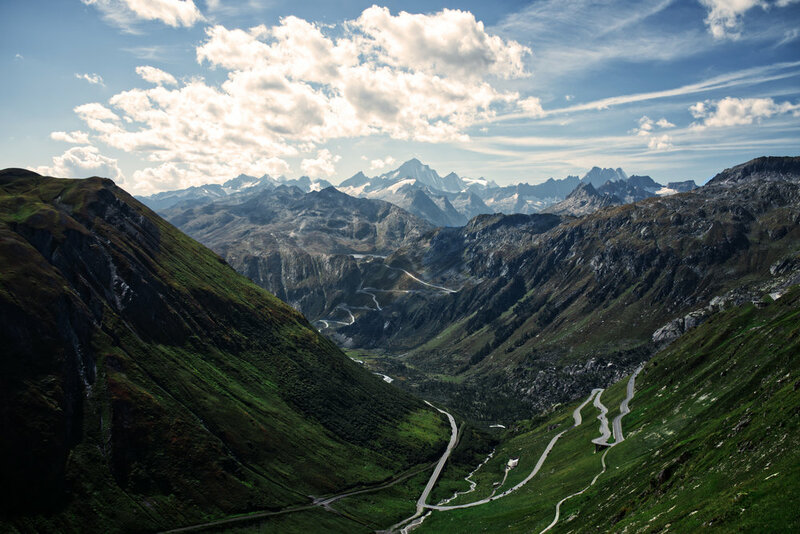 “The Grimsel Pass (German: Grimselpass; French: Col du Grimsel) is a mountain pass in Switzerland, crossing the Bernese Alps at an elevation of 2,164 metres (7,100 ft). The pass connects the Haslital, the upper valley of the river Aare, with the upper valley of the Rhône. In so doing, and as the Aare is a tributary of the Rhine, the pass crosses the continental divide between the North Sea and the Mediterranean Sea. A paved road follows the pass, running 38 kilometres (24 mi) from Gletsch to Meiringen. The road is normally closed between October and May, due to the high snowfall on the pass. As it is the only direct road pass between the cantons of Bern and Valais across the Bernese Alps, attempts are made to keep the road open as long as possible with snow ploughs. A PostBus Switzerland service uses the pass several times a day, connecting Meiringen and Oberwald. I think Susten Pass is actually my favourite of the passes, with some amazing long, sweeping corners. Simply amazing. I took some video footage but haven’t gotten around to more than glimpse at it thus far.